Elegant gold rings for women online! Your search for gold ring design for female will bring you to papilior.com and give you enchanting designer jewellery options. Old is gold is a very popular phrase and though not spoken about the metal itself it does hold some importance, Gold being one of the most oldest metal by that we mean used by the generation before us and symbolizing something pure, auspicious and of prime value. Here find the best gold ring price in a pool of intricately crafted jewellery where even simple gold ring can be a statement piece and gold wedding rings can bring two souls together. 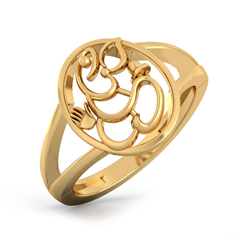 Shop for gold ring design for female without stone at a price range starting at INR 7000 going up to INR 15,000 at papilior.com, the prices may also depend upon your choice of 14k or 18k beautiful rose, white or yellow gold and the making charges. Many women today prefer to shop for finger rings gold online as it is accessible, easy and such a convenience to browse through and choose from a vast array of designer jewellery.